Skip the worry of finding a taxi to take you from your Phoenix-area hotel to the airport by pre-booking this reliable shared transfer service to the Phoenix Airport (PHX). Your professional driver meets you to the door of your hotel to take you to the airport with efficiency and comfort. Enjoy peace of mind as you travel from your hotel to the airport with plenty of time to catch your flight. Your professional driver meets you in the lobby of your Phoenix-area hotel. 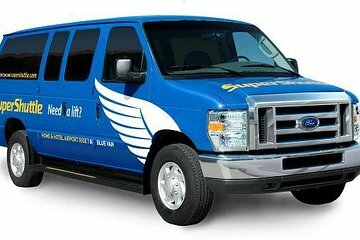 Travel in relaxed comfort in your shared vehicle during your transfer to Phoenix Airport (PHX). Your driver ensures that you arrive at the airport relaxed and with plenty of time – it's that easy! By pre-booking this convenient shared airport departure transfer, you avoid the hassle of finding a taxi or figuring out the public transportation system and end your vacation or business trip to Phoenix in style. When booking, please provide your departure flight details as well as your hotel information. Your transfer will be confirmed at the time of booking and you will be provided with a travel voucher to present to the driver. I made the reservation through Viator. It was completely screwed up. I spent several calls to Super Shuttle trying to straighten out my reservation. No one seemed capable of understanding my repeated requests for a wheelchair accessible vehicle. This was an excellent trip. Our driver was the epitome of courtesy and professionalism. He went over and above the call of duty by dropping our bags on the sidewalk in front of the terminal. The agents failed to tell me that I need to call the local shuttle company. I was late for my flight and costed me more money to take a cab. We were told a time that was a half hour before the driver was told to pick us up, but we still made our flight on time. I would definitely use their services again. On time and great service. Driver was on time and very pleasant. The transportation was on time and very helpful. Just a little confusing with the Viator voucher driver forgot I gave it to him so he was calling me via phone for it. Other than that everything went great. I would highly recommend using Viator for the added discount.